Move-in by April 30 to receive an one-bedroom apartment at the rate of a studio for one year. + No Community Fee ($1,000 Savings) + Free Moving Assistance Offer valid to new residents until April 30, 2019 and moving assistance up to $750. The people at Garnett Place Retirement Community were really nice. The lady that gave us the tour was super friendly and she had us sit down and eat a Thanksgiving meal with them. It was delicious. She was really knowledgeable and very nice. The room was a little old and a little outdated, but it was spacious, nice, felt warm, cozy, and homey. Thank you for recognizing Garnett Place as a friendly, warm community. We're so pleased to hear you enjoyed your tour and our team members. Please feel free to reach out to us with any current or future needs. We are here to help as a trusted, established community. I toured Garnett Place Retirement Community, and it was very welcoming, clean, and very friendly. It was a bit more difficult to get around since it has multiple floors, and you would need to take the elevator. The staff member was helpful, showed me the rooms, it was a very nice place, and that would have been my top choice. The menu looked good, and there were choices, however, it was a bit more expensive than other places. Carol, Thank you so much for sharing your experience at Garnett Place. We're so happy to hear that you found our community to be clean and welcoming, as well as our staff to be friendly. We'd love to host you again for a meal or activity if you're interested! Please let us know if there is anything else we can do for your family! Garnett Place was awesome and very clean. It has independent, assisted and memory care. They cook good meals, they have tons of activities in house, and they’ve got an awesome guy that drives a van and takes them places. They’re pretty comprehensive. The staff was wonderful and very helpful. She has good days and bad days. The price is very reasonable. Thank you so much for taking time out of your day to share your experience at Garnett Place. We are pleased to hear that you are happy with the staff members, amenities and services. We will be sure to share your feedback with Steve, our Transportation Coordinator. Thank you and please let us know if we can accommodate your family in any other way! The people at Garnett Place were wonderful. What they offered to let me do was, at no cost, stay with my mom up to three or four months and eat their food until she got used to it. I thought that was wonderful. The food was great. The people were outstanding. The lady there was so nice. The room was too big in my opinion, and it had a stove, which I wasn't sure I wanted that in the room because of her memory issues. The room was beautiful and had bedroom, a living area, and a patio. They had basically the same activities as other places, like a garden and trivia and "fill in the blanks" games. Thank you for reaching out to review your experience with Garnett Place. We appreciate your recognition of our team who always strives to provide the very best for our residents and their family members. Please let us know if there is anything we can do to improve. I visited the Garnett Place. The rooms were very nice. We saw the independent and the assisted living sections and had a good lunch with them and met the chef. The person who is in charge of the marketing was very nice. The staff was very helpful. We like the place a lot, but they don’t have an actual nursing home facility connected to the place. Garnett Place was OK. It was an older building, but other than that, it was more than sufficient. There was an activity room for doing puzzles or watching TV. The dining area was fine. Thank you very much for taking the time to provide Garnett Place with valuable feedback. We appreciate your opinion and are always looking to improve the lives of the seniors we serve. If there is anything we can do to better the next experience, please let us know. Again, thank you for your feedback! Garnett Place is very good. The staff is nice and very informative. They took us all over and showed us everything. We haven't had any complaints since my mother moved in there. We like the rooms. We had to put her in the memory wing, which was the only place we found that was similar to her apartment before. I have eaten there and don't have any complaints about the food. They have lots of activities, but my mother’s memory is bad. If she participates, she does not remember. They have bingo and all kinds of activities for the patients. Thank you so much for taking the time to review Garnett Place Retirement Community. Your kind words are so appreciated and we will be sure to share with our staff. Also, we would love the opportunity to talk to you more about our Smile Program that allows family members to see what their loved ones are up to on a daily basis. From activities and events to outings and parties, you would be able to see photos, share messages and view activity participation charts for your loved one. This is a great way we help "fill the gaps" in our residents' memories. Again, thank you and we feel very privileged to care for your mother at Garnett Place. The staff at Garnett Place Retirement were wonderful and very informative, very patient. One of the things that impressed us was how residents are just walking around, and everybody seemed to know their names and interacted with them. It was a very nice place. The rooms were okay. The price was competitive with the other facilities. They have activities both in and out of the facility. Outside, there was a garden where the residents could plant vegetables and flowers. They have the usual crafts and things. The dining area was a very nice facility. We were impressed with the menu they offer for the residents. Cynthia, Thank you so much for taking the time to give us feedback regarding your recent tour of Garnett Place. It was great to read that you found our staff and residents to be friendly and pleasant, as we pride ourselves in being just like family. When you are free, we would love for you to join us again for a meal or activity. Please let us know if there is anything else we can do or any questions we can answer! The only reason I decided not in Garnett Place was because it is different levels. There’s an elevator, but there are a lot of steps also and I just thought it was confusing to me and to my husband. I thought it would be hard for my husband to get around and to keep track of where he was. The rooms were nice. The ones we looked at were either 1- or 2-bedroom. You had your living room area and a kitchenette that didn’t have a stove but they had a microwave, a refrigerator, a sink, and a full bath. I really liked Garnett Place Retirement Community. It had ramps and was convenient for wheelchairs. The place was nice and luxurious. The rooms were big enough with full-sized beds. The staff was excellent. The location was close to everything and they had a bus to take residents to doctors' appointments. Eric, we appreciate all of the great things you have to say about Garnett Place! It's our pleasure to 'roll out the red carpet' everyday and we're happy to have done so for you as well. We'll be sure to share your feedback with our staff as well! Thank you very much! Kaelee F. spent time with us and was WONDERFUL. We will keep this facility on our radar :) We have ask her to keep in touch with us also. Thanks Kaelee. Bob and Shirley P.
Bob & Shirley, Thank you so much taking the time to give feedback about your recent experience at Garnett Place. We are so happy to hear that Kaelee and the Garnett Place team provided you with notable hospitality. Please let us know if we can do anything going forward. We appreciate it. We got a reservation to put my mom in Garnett Place. We like the overall set-up of it. The apartments are nice size. Where her apartment will be is close to the lunch room, and there is a nice little sitting area outside. The staff is very friendly. The girl that we met with a couple of times was always very receptive and very cooperative in answering any questions. The only drawback to me was where it is located. It was a little dark, but other than that, it was very nice. All Garnett Place employees receive Relias training upon hire, as well as biweekly in-service training, including coordinators, health aids, housekeeping and culinary. Describe the overall population of assisted living residents at Garnett Place Retirement Community. What is their average age? What are their favorite things to do? Our residents range in age from 60-101, however, the average age is 84. At Garnett Place you choose how you want to spend your day, if you want to be active and social, we offers 6+ daily socials and recreational activities, otherwise, you are more than welcome to do whatever activity you please in your apartment. What programs or activities does Garnett Place Retirement Community offer to enrich residents' well-being? Garnett Place offers 6+ daily socials and recreational activities. In addition to our activity programs we offer the Smile Program to keep family members up-to-date with their loved one, the Friend For Life Program which matches our residents with a friend in the community, and the Dare to Dream Program which makes residents' dreams come true month. Some of the most popular activates are our Live 2B Healthy Senior Exercise classes and Music Speaks Music Therapy classes. What places are near Garnett Place Retirement Community or within walking distance for assisted living residents to enjoy? Garnett Place is located off of 1st Ave in Cedar Rapids just behind the Town and Country Center within walking distance to Fareway Grocery Store, clothing stores, restaurants, and banks. Garnett Place is also only 1 mile from Lindale Mall. What transportation services does Garnett Place Retirement Community offer to assisted living residents? Garnett Place offers free Cedar Rapids area scheduled transportation Monday through Friday 8:30 a.m. to 3:30 p.m.
What makes the chef or dining program at Garnett Place Retirement Community exceptional? What kind of menu can assisted living residents expect? Garnett Place offers three home-cooked meals, served restaurant style with Always Available Menu and daily specials. There are three dining rooms to choose from and each meal has a two hour dining time. Residents are able to choose what time they would like to dine and what they would like to order, no pre-ordering or scheduling is necessary. Residents are welcome to have guest at meals which cost $5 per guest and all guest meal money is donated to the Alzheimer's Association Walk to End Alzheimer's. What safety features or security measures does Garnett Place Retirement Community offer to assisted living residents? Garnett Place has the Stanley Security System with secured community in place. The community's front doors are locked after 5:00 p.m. and reopened at 8:00 a.m. for security purposes. Residents are welcome to have visitors anytime, but visitors must ring door bell to let inside afterhours. We also have Wander Guards in place if family members are worried about their loved ones' wandering. How does Garnett Place Retirement Community keep residents' families informed about their loved ones? Garnett Place offers the Smile Program which is an online portal where family member can login to see what activates their loved one has done each day. Photos can also be posted and shared through the Smile Program as well. What is the care staff-to-resident ratio at Garnett Place Retirement Community during daytime and nighttime hours? At Garnett place our staff to resident ratio is 1:10. If Garnett Place Retirement Community accepts dogs or cats, what indoor/outdoor areas can they enjoy? Yes, Garnett Place is pet friendly. We have residents with cats, dogs, birds, fish and even butterflies. Pets are welcome in community space on a leash. We have a walking trail and court yards our pet owners enjoy, as well as dog waste stations. Describe the overall population of independent living residents at Garnett Place Retirement Community. What is their average age? What are their favorite things to do? What are some recent off-site events that the community activity director at Garnett Place Retirement Community has organized? Garnett Place does a field trip or outing every Tuesday. Some recent outings include a Kernals Baseball Game with lunch at the ballpark, fishing at Pinicon Ridge with a picnic, watch RAGBRAI in Iowa City, tour the Cedar Rapids Central Fire Station, Riverside Casino, Cedar Rapids Public Library, Movie theatre with popcorn and snack included, Bever park, etc. Resident's input is very important to us, if you would like to make a trip somewhere, we will try our very best to make it happen. What transportation services does Garnett Place Retirement Community offer to independent living residents? What makes the chef or dining program at Garnett Place Retirement Community exceptional? What kind of menu can independent living residents expect? Garnett Place offers many community areas such as the front lobby with fish tank, Library Nook, Gym, TV lounge, activity rooms, On-site beauty and barber salon, Beautifully landscaped courtyard, patio and walking trail. What safety features or security measures does Garnett Place Retirement Community offer to independent living residents? Garnett Place has the Stanley Security System with secured community in place. The community's front doors are locked after 5:00 p.m. and reopened at 8:00 a.m. for security purposes. Residents are welcome to have visitors anytime, but visitors must ring doorbell to let inside afterhours. Does Garnett Place Retirement Community work with an agency or registry to provide nursing and medical assistance as needed? Garnett Place offers 24-Hour Home Health Services in your apartment. If you would prefer to use an outside agency, you are welcome to use the place of your choice. We can also recommend agencies as you see fit. 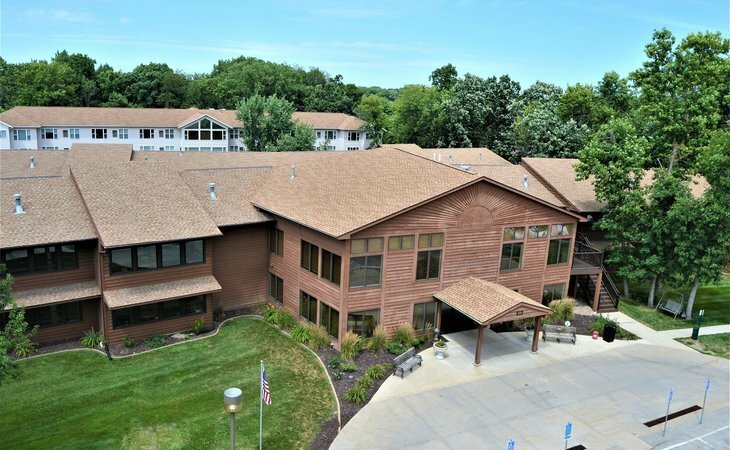 Garnett Place Memory Care has 8 apartments and it staffed 24 hour per day. What safety features or security measures does Garnett Place Retirement Community provide to protect residents who wander? Garnett Place has Wander Guards in place for Assisted Living at all exit doors. When the resident gets near an exit door, an alert goes off for staff. Garnett Place also offers Memory Care which is a secure floor with 8 apartments and one Health Aid at all time. What programs or activities does Garnett Place Retirement Community offer to keep residents engaged? How does the staff engage residents' long-term memories? Garnett Place offers 6+ daily socials and recreational activities. In addition to our activity programs we offer the Smile Program to keep family members up-to-date with their loved one, the Friend For Life Program which matches our residents with a friend in the community, and the Dare to Dream Program which makes residents' dreams come true month. Some of the most popular activates in our Memory Care is Music Speaks Music Therapy, Scenic Drives and weekly live music. Garnett Place Health Care Coordinator, Lee Thoma will do a complete Cognitive and Functional Assessment to determine the exact care needs of a resident prior to move-in. During the assessment we record baseline vitals and use for our PointClickCare system that HealthAids have access to at their fingertips. Our Health Care Coordinator, Lee Thoma does an assessment every 30 days or anytime there is a change of condition such as a hospital stay. What techniques does Garnett Place Retirement Community use to support memory care residents during mealtimes? Garnett Place has a very personalized dining experience. Since there are only 8 apartments in memory care, the meal setting is similar to family style. We use picture menus and have an observation plate with the meal on it, in addition to colored plates for stimulation. How does Garnett Place Retirement Community keep residents' families informed about their loved ones' health? Garnett Place keeps families informed about their loved ones' health by contacting the family via phone if there is any change of condition. We also use the Smile Program to keep family members up-to-date with their loved one's social life. Describe the neighborhood around Garnett Place Retirement Community. Is it located in a residential neighborhood, a business district, a rural setting, or other type of locale? Garnett Place is in a residential neighborhood surrounded by trees and very secluded, even though we are located South of 1st Ave in Cedar Rapids just behind the Town and Country Center. Is Garnett Place Retirement Community affiliated with a hospital if more care is needed? Garnett Place is no affiliated with a hospital but we have a close working relationship with hospitals and doctor if more care is needed. Activities Extra: Support Group, Massages, Manicures, Campfires, Etc. Garnett Place is an established community since 1985 with a country feel, nestled in a quiet wooded area yet only a couple blocks from bus routes, shopping, and dining. Our friendly, compassionate, and dedicated staff makes Garnett Place easy to call home by finding the uniqueness of each resident and treating everyone who enters like family. Garnett Place offers a choice of spacious Enriched Independent apartments and townhomes as well as Assisted Living apartments with several floor plans which all include kitchens/kitchenettes. Both Enriched Independent and Assisted Living provide 3 restaurant style meals, housekeeping/laundry, wireless emergency response system, 24/7 staffing, full and part time nurse on call 24/7, personalized assistance with all activities of daily living, weekly vital sign clinics, scheduled transportation, and other great amenities. We are a resident centered community where residents choose how they prefer their care, services, and environment. Friendships and a sense of community are naturally fostered at Garnett Place through the Life Enrichment program which provides wellness, social, spiritual, and educational opportunities daily. We look forward to you joining our family. Garnett Place is tucked away in a wooded area of Cedar Rapids, full of wildlife and nature. Our community is just off the beaten path, but still close to medical services, restaurants, shopping and entertainment. What should caregivers and potential residents know about Garnett Place Retirement Community?